The publication and publicising of books by T. R. Robinson. T. R. Robinson Publications is owned by T. R. Robinson. ™ This logo represents T. R. Robinson Publications ™ wherever it appears. For the sake of consistency, it is also shared by author T. R. Robinson (Owner of T. R. Robinson Publications) in preference to a photograph. T. R. Robinson is an independent author of memoir, autobiography, biography and fiction all of which are based upon life experiences; hers and others.Though born into a loving family she eventually suffered war and abuse and subsequently married and moved to England. Following her divorce she had various employments ranging from managing small electrical components, laboratory assistant, hospital orderly, waitress and much more between. Her writing career commenced in 2013. They acknowledge it was distressing and difficult to recall much of what is shared in the books; ‘Still painful to effectively relive those experiences all over again – they are never forgotten’. That is not to say the books are all negative; lighter, fun filled experiences that still bring a smile to their face are also shared. Authoring etc. – Beside the authoring and publishing of books, T. R. enjoys sharing, with fellow authors and readers, through this website, social media, and by direct contact, their own publishing experiences and knowledge. Other – Further interests include current affairs, national and international, and visiting places of natural beauty. 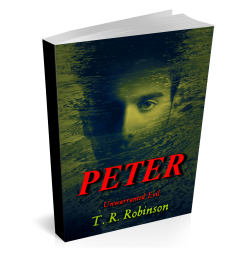 Why T. R. Robinson Publications? When commencing their author career T. R. had little understanding of the publishing industry, traditional or independent. Consequently, the initial years presented a steep learning curve. Nevertheless, they persevered and have now published a number of books. As with any profession (authoring is a profession), they absorbed a lot of information along the way and was particularly grateful to those kind people who freely shared insights and information about the process. Having gained a small measure of success they wished to reciprocate by helping others on their author paths. They had also appreciated book recommendations received and again wished to reciprocate. A natural extension of both is a willingness to assist fellow authors with the publicising of their works. Information was initially shared by means of personal blogs but the requirements for a more professional, further reaching, base was soon acknowledged. T. R. Robinson Publications is the result.